COLONIZATION - Colonization is when microbes move in and themselves at home in the host. For example, the average human body is made up 37 trillion cells, but we have 10 times that many bacterial cells that have colonized our bodies and call our bodies "home"! 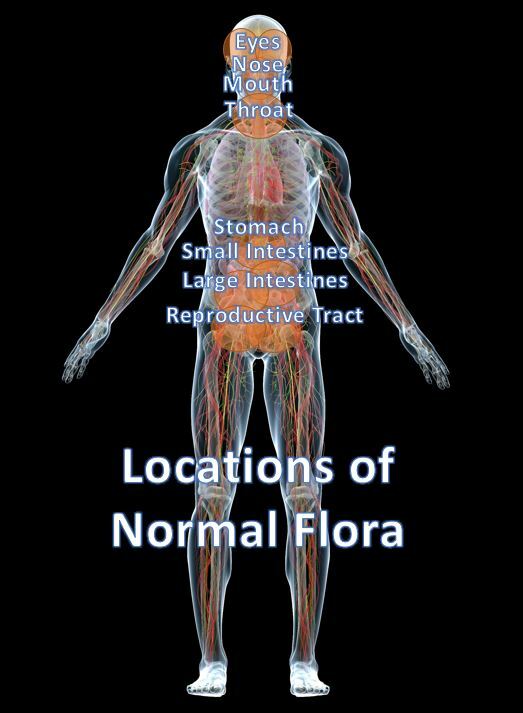 So, in addition to our 37 trillion "human" cells, we have what we call our "normal flora." Our normal flora consists of all of the many different kinds of microbes that inhabit our body! We can say that this normal flora are microorganisms that have colonized our bodies. The natural flora of our bodies can be found on our skin and in our digestive and reproductive tracts, as well as our eyes, nose, mouth and throat. The other areas of our bodies should remain microbe-free. When we have these microbes (normal flora) in or on our bodies in the places where they are usually found, they do not harm us and in fact often help us stay healthy! We do not consider these areas with colonizing microbes "infections". However, when microbes from one part of the body invade another part of the body where they are usually not found, they can be harmful, or even deadly! An "infection" occurs when a microorganism gets into (or onto) a part of the body where it normally is not found. 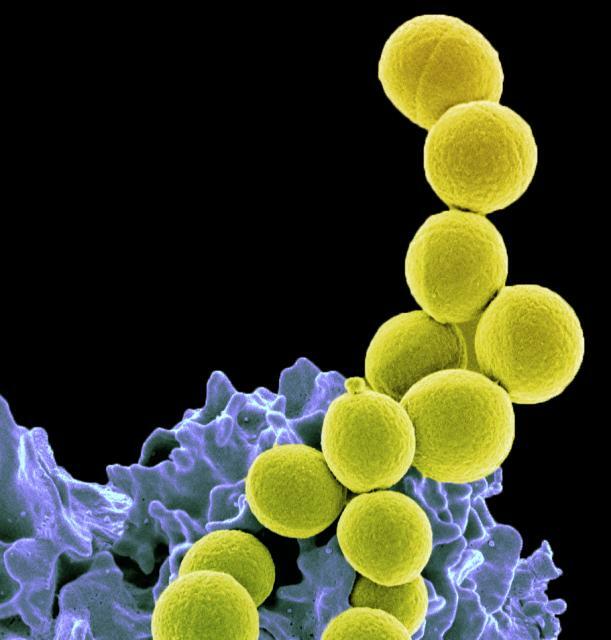 However, if a person were to cut themselves or get some kind of open wound on their skin, the Staphylococcus aureas has a chance of penetrating through the outer layers of skin and entering the blood stream. At this point, the person is said to have a Staphylococcus aureas infection. An infection is defined as the presence of a microorganism in a part of the body where it is normally not found. An infectious disease is defined as an infection that causes harm to the host. An infectious disease is when the microbial infection leads to some sort of functional disorder in the host. A pathogen is a microorganism that causes disease. 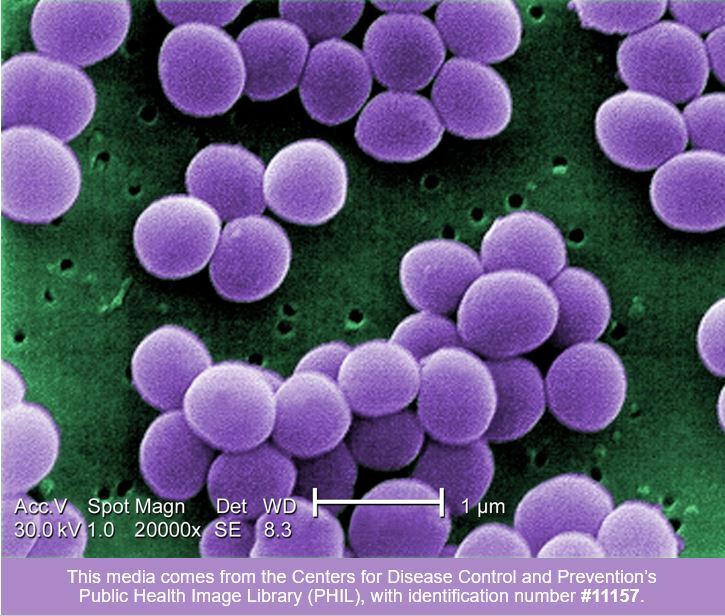 Once Staph aureus enters the blood stream it is pathogenic and can then invade internal organs causing more harm to the host in a condition called toxic shock syndrome, which can lead to death. Doctors use the signs and symptoms of a disease to determine the disease, the pathogen, and the course of treatment. Since different pathogenic microorganisms have different effects on the human body, knowing the signs and symptoms is vital to the diagnosis. Signs are objective. This means that the signs of a disease can be determined by observation of an unbiased medical provider or measured by some sort of medical test. For example, bumps on the skin, fever, or a mass on an X-ray would be considered a "sign" of the disease. Healthcare providers can see and measure the degree to which the person is being effected by the illness. More examples would be fever, because it is measurable by a thermometer, and paralysis is observable and measurable by determining the limitations of normal movement (partial paralysis / complete paralysis). Symptoms are subjective. Healthcare providers must rely on the patient's description when it comes to symptoms, because symptoms cannot be directly observed or measured by anyone other than the patient. Examples of symptoms can include nausea, head ache, fatigue, loss of appetite, and pain. Medical professionals will ask patients to rate their pain (or other symptom) on a scale from 0 to 10. This is called the Wong-Baker Faces pain-rating scale. An alternative method of quantifying pain is measuring skin conductance fluctuations. of disease on the health of a specific population. While epidemiologists study all diseases and not just the diseases caused by microorganisms, we will be focusing our discussion of epidemiology to infectious diseases only. Scientists that specialize in the field of epidemiology are called epidemiologists. Epidemiologists have 3 main goals. There are 4 stages or phases of an epidemiological study. Disease Etiology - To determine the disease etiology (etiology = causing agent) is to figure out what pathogen is causing the outbreak of the disease. Outbreak Investigation - To determine how, when, where, and why the outbreak occurred. Disease Screening and Surveillance - To determine patterns and predict future outbreaks based on collected data. Comparisons of Treatment Effects - Clinical trials are performed in efforts to prevent future outbreaks. The etiology of a disease is the cause of the disease. Finding the microorganism that causes the disease or the condition in question is extremely important. The epidemiologist must first determine what type of microorganism is causing the disease. An etiological agent is the microorganism that is responsible for causing the disease. The more information that the epidemiologist knows about the etiological agent (the disease-causing agent), the more likely they will be able to understand how to control the spread of the disease, as well as how to prevent outbreaks from happening in the future. When epidemiologists identify the microbe involved in the outbreak, they can identify how the disease is being spread. This information is very useful. Zoonotic Factors - If the disease is able to be spread from an animal to a person (like rabies) it is a zoonotic disease. Zoonotic diseases are typically diseases that are endemic to animal populations, but are able to be spread to humans upon certain types of contact. ​Arthropod Vectors - Diseases may be spread or transferred through arthropod vectors such as ticks, mosquitoes, fleas, mites, etc. These are called vectors instead of "factors" because these are living organisms. An example of this is the spread of the disease, malaria. Mosquitoes can carry the pathogenic protozoa, Plasmodium, which can be transferred to humans. Once the Plasmodium is transferred from mosquitoes onto humans, the Plasmodium can lead to malaria. So we can use this information by deceasing mosquito populations, wearing protective clothing, etc. Behavioral Risks / Life-Style Factors - Some disease may be associated with behavioral risks or lifestyle factors. Incidence is the rate of new (or newly diagnosed) cases of the disease. Prevalence is the actual number of cases alive, with the disease either during a period of time (period prevalence) or at a particular date in time (point prevalence).